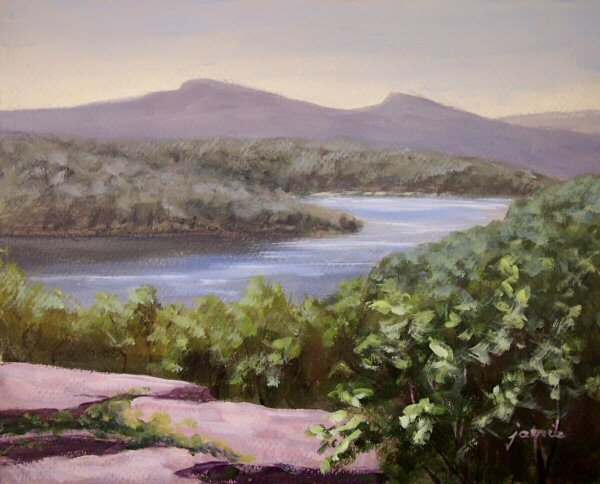 This painting was done over a period of several days on location from one of my favorite painting spots at Ward Pound Ridge Reservation in Cross River, NY. It is a view of an old farmhouse currently occupied by one of the preserve managers. 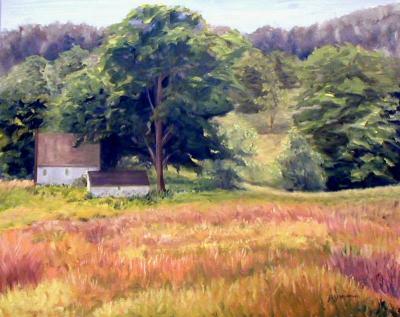 The fields turn brilliant colors starting in late summer and continuing through the fall. 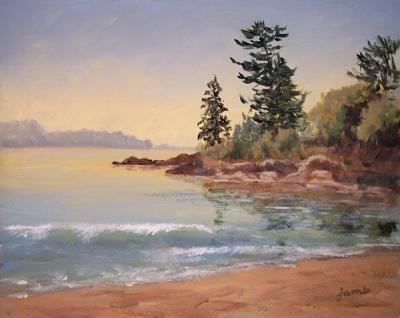 This beautiful cove sits nearly deserted beside the major road, Route 3, that runs along the shore of Mt. Desert Island as you enter from the mainland. I spent a quiet morning painting here with Gail Ribas (head of the Acadia Art Workshops) and her mom. It was a hazy, still morning, filled with serenity and subtle colors. 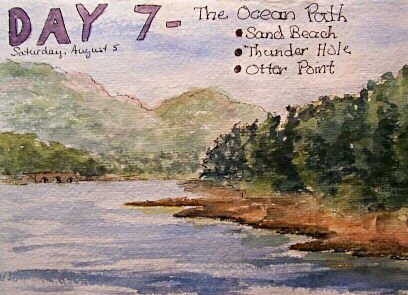 Sand Beach is one of the most beautiful spots in Acadia National Park, on Mount Desert Island, Maine. We settled in for a morning of bright sunlight and strong wind—too strong to use my beach umbrella for shade. The rocky slope and blue-green water were a challenge to paint of the very best kind! I set my painting chair in the sand and used my lightweight painting box to capture the scene. Every summer, my husband and I go up to Acadia National Park in Maine. We spend at least one day strolling along the beautiful ocean path , enjoying the scenery and ocean breeze while chatting and taking pictures. This painting was done this morning from one of the photographs I took there. 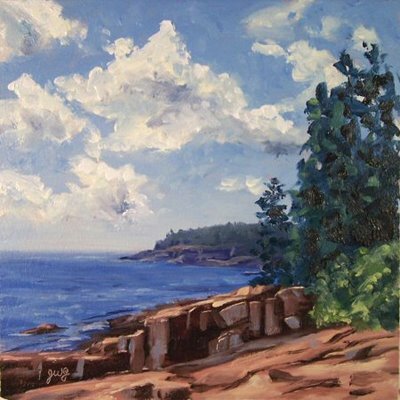 I used a couple of paintings that I’ve done on location there as color references, since pictures never tell the whole story. Acadia National Park in Maine is by far my favorite vacation spot. 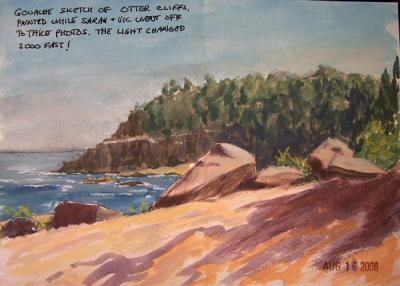 This was painted from a photo I took during one of my annual excursions there. 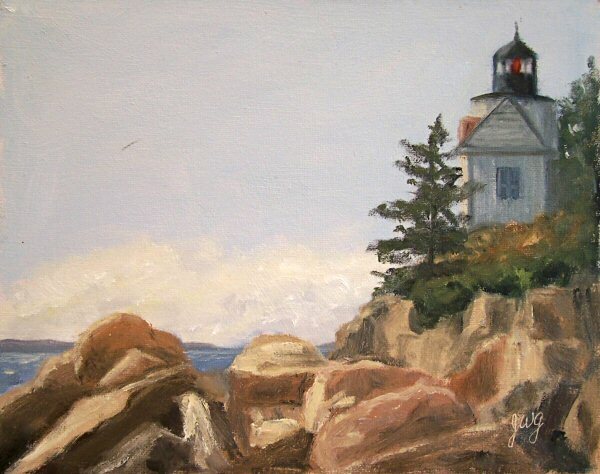 I never get tired of visiting Acadia, and I never get tired of painting it either! There are many fabulous sites along the Ocean Path in Acadia National Park, but it’s hard to beat the views from the very end, when you arrive at Otter Point. 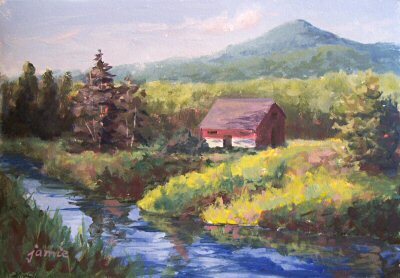 I’ve done lots of paintings from this location, and I’m sure there are many more to come. 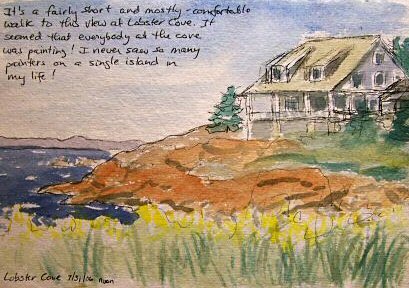 During part of our trip, we stayed at the wonderful Bar Harbor Inn. The Shore Path runs right outside the hotel. I’d take a stroll along the path every day, stopping to sketch a little something along the way. 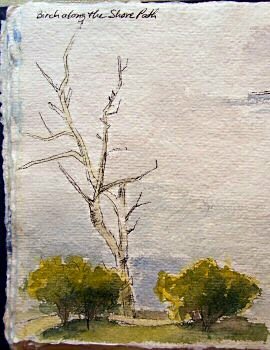 I loved the shape of this bare tree (above), flanked by the bushes. This huge yacht, The Floridian (above), anchored just offshore from the balcony of our hotel room. I sketched it as the helicopter took off. The folks on board spent a lot of time hitting golf balls into the ocean and playing with the jet skis that emerged from a huge door in the hull. A rusty, old lobster boat anchored out there too, with one of the Porcupine Islands as a backdrop to the scene. No trip to Mt. Desert Island is complete without a visit to the Jordan Pond House for lunch or dinner. We worked up an appetite by hiking around the pond first. 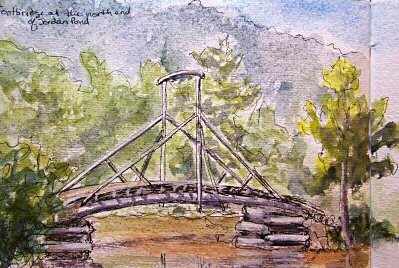 There’s this fabulous wooden footbridge at the far end of the pond where I stopped to sketch while my husband took some pictures. 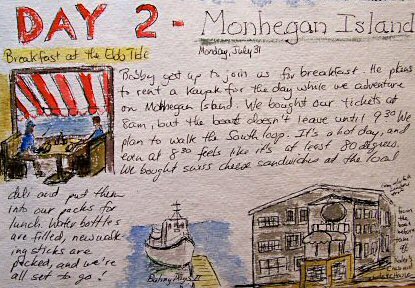 This second day of our trip we went to Monhegan Island for the day. All artists need to make a pilgrimage there; you’ve never seen so many artists painting in one place at the same time! We chose the wrong day to go though, with record-breaking heat, no shade in sight, and no ice nor air conditioning on the island! Painted en plein air on Mt. Desert Island, Maine. 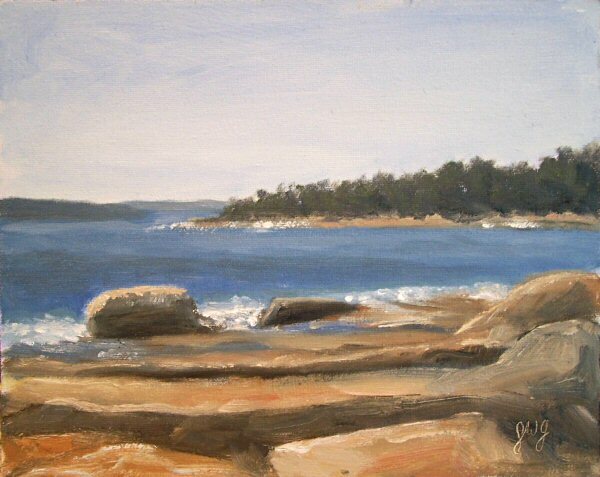 One of the summers I was in Maine, I looked all over Little Cranberry Island for the perfect scene to paint. I finally came upon these wonderful boathouses, set in fields of Queen Anne’s Lace, just before the boat was to leave and I had to head back to Mt. Desert Island. It was too late at that point to pull out my paints and capture them en plein air, but at least I was able to get some nice photos to work from. 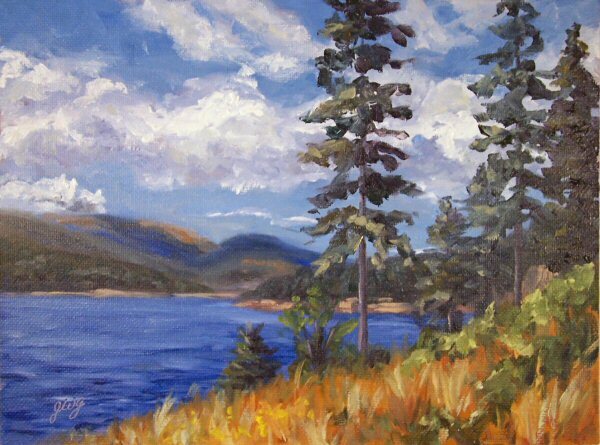 Painting this scene brings back wonderful memories of my time there. This linen is wonderful to paint on. I sealed it clear, and leave some of it exposed beneath the paint surface. The texture and color make me not want to paint on anything else! I am painting a number of views of this charming red barn in the Platte Clove area of the Catskills. One of them will become a large painting at some point this year. I’m testing out a number of vantage points, crops of the scene, and colors on my palette on small paintings to decide which I like best. I am liking this one a lot! $395.00 plus $25 shipping and insurance within the Continental United States. For local sales, shipping charge will be allocated to NYS Sales Tax. Please email me at JamieWG@aol.com for International purchases or with any questions. 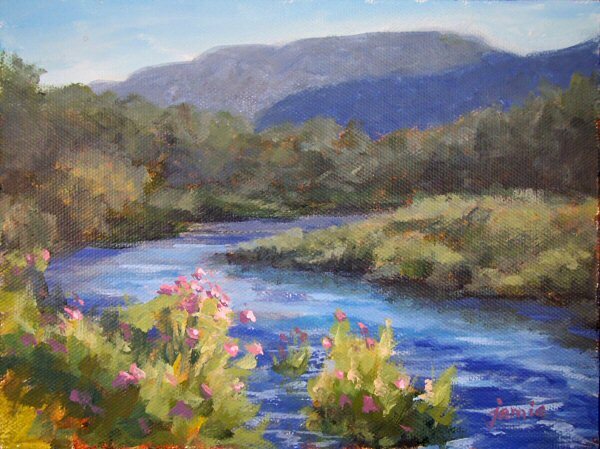 This is the third in my series of paintings from Platte Clove in the Catskills. 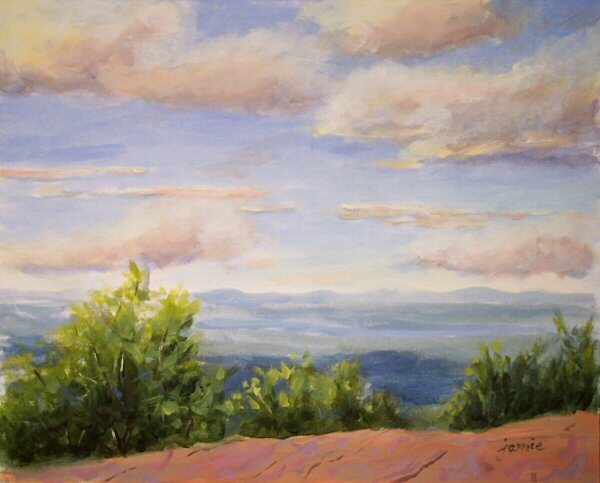 This road to the distant mountains, with the tall post entryway, in the strong, late day light, provided a view that was truly irresistible to paint! $290.00 plus $20 shipping and insurance within the Continental United States. For local sales, shipping charge will be allocated to NYS Sales Tax. Please email me at JamieWG@aol.com for International purchases or with any questions. 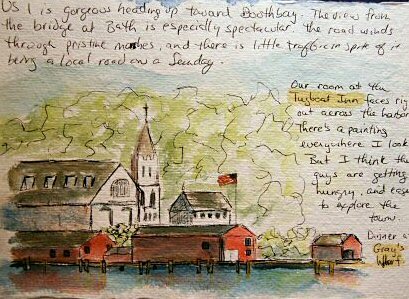 Anybody who’s taken a drive through the Platte Clove area of the Catskills understands the incredible beauty that abounds at every turn and offshoot along the road. This was one of the spots where my husband and I just had to jump out of the car to take photos! 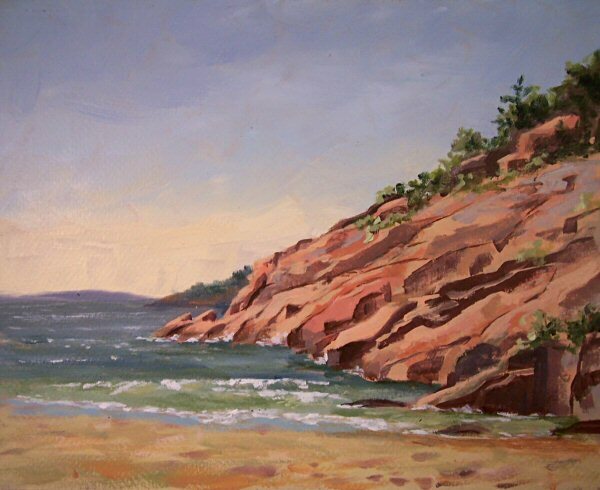 I didn’t have time to paint on location there, but I’ll be doing more from my photo references for sure, and plan to make it a point to allow time for plein air work there next time around! $115.00 plus $10 shipping and insurance within the Continental United States. For local sales, shipping charge will be allocated to NYS Sales Tax. Please email me at JamieWG@aol.com for International purchases or with any questions. I’ve finished posting the plein air paintings from my Hudson River School trip, and am now beginning to work from the photo references I took. Many of these are deserving of large canvases. I’ll be doing these small ones now, then selecting from these scenes to do big paintings once the weather turns cold and I’m in the studio for the winter. 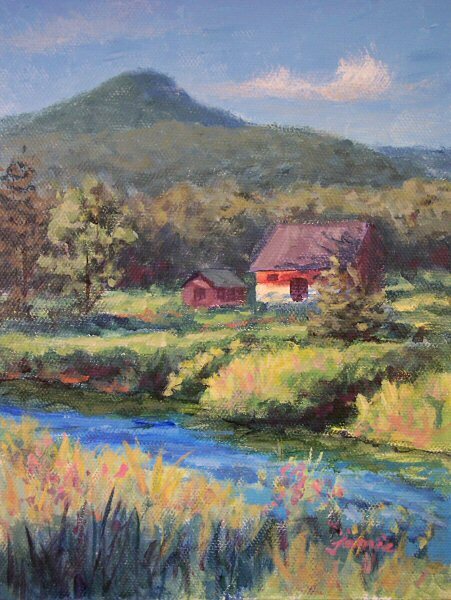 This charming red barn by the stream in the Platte Clove area of the Catskills yielded lots of potential paintings, so there will be more to come from different vantage points of this charming little burst of color amist the greens. The stream there was the icing on the cake! Many Hudson River School painters, including Thomas Cole and Jasper Cropsey, painted from this spot high above North South Lake. I can see why they derived so much inspiration from this location. Although the view faces west and offers spectacular sunsets, my husband and I opted to make the one mile climb up there in the early morning to beat the heat. 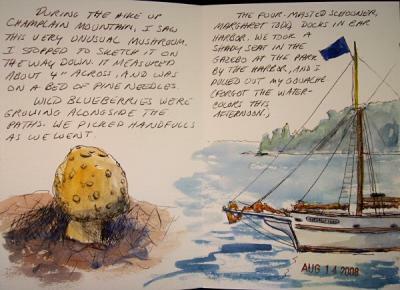 I sat on a large rock slab in the shade provided by the huge Sunset Rock, and used my small, foamcore pochade box, which was a real godsend on this trip! 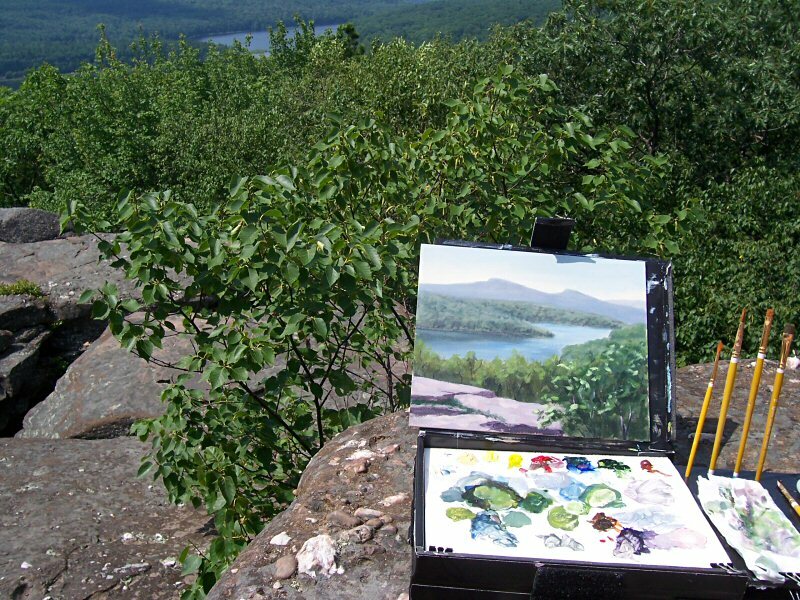 When Hudson River School artist Thomas Cole painted from this very spot, he had both eastern and western views. 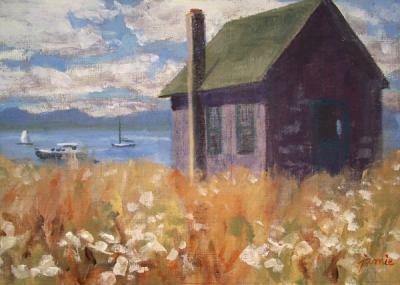 Now the western view is overgrown, but the eastern view still goes all the way past the Hudson River to the Berkshires. The Catskill Mountain house was a popular resort back in the early 1800s, but like most of the Catskill resorts, later fell into disrepair as tourism in the area declined. All that remain are two stone pillars leading to the site, and of course the awesome view. My husband and I set up by this ledge overlooking the valley. I was painting and he was taking photos. What a peaceful way to end the day.